I've never used any kind of underwater housing myself, but there seems to be keen interest in the topic, so I have the following information here which various people have sent in. 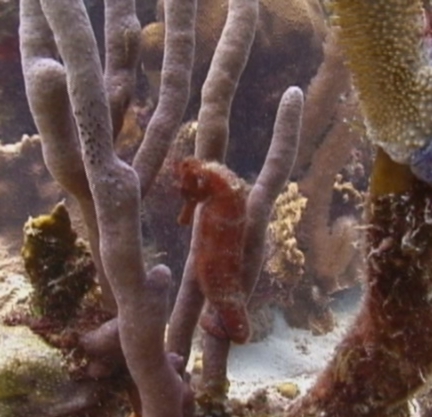 Also, check out the underwater video forum at videouniversity.com. 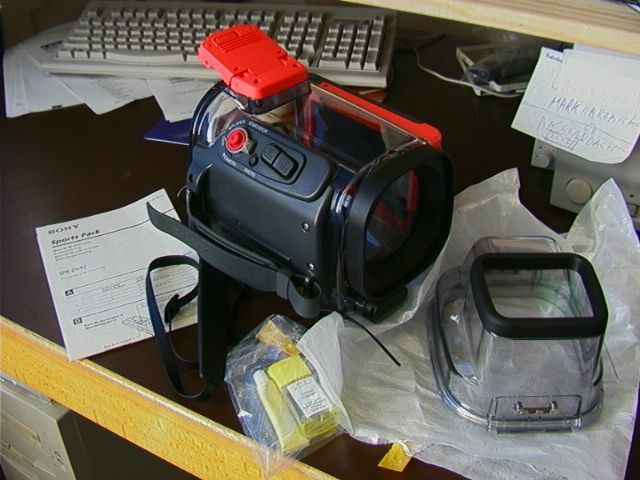 B&H has underwater equipment from Ikelite, Amphibico, Quest, EWA-Marine, and others. 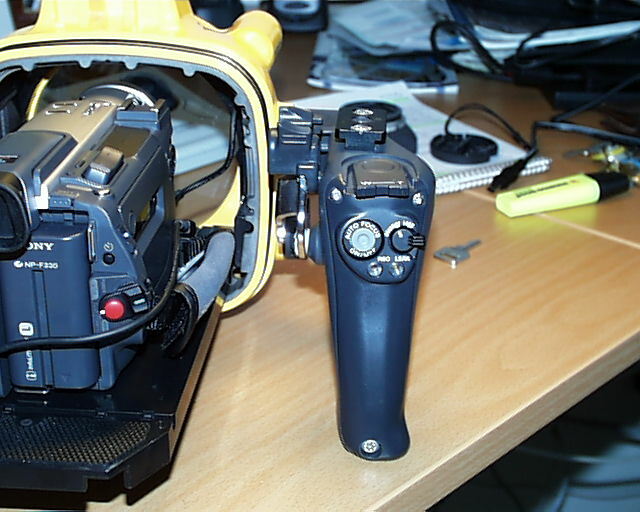 Seacam Subsea Systems makes the DV/S2 housing for the TRV900 which also requires the Citizen 2.9" LCD monitor. Light & Motion Industries makes some high-end housings. 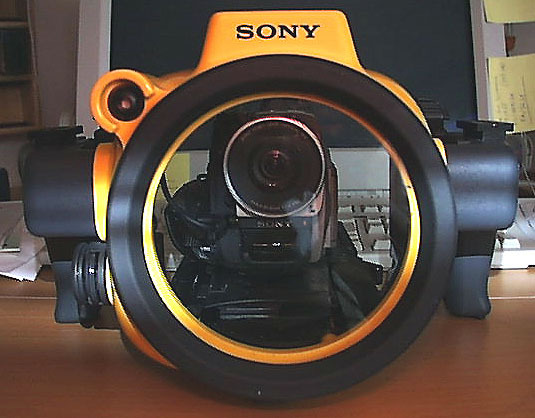 The most unusual housing I've seen is the Ocean Brite which is large enough to house the camera with the LCD open. The SeeBubble is a very inexpensive housing, as a kit or do-it-yourself project, and has links to many other inexpensive options. I have heard of only one kind of underwater microphone. There is a photo and video competition at the SEASPACE scuba convention in Houston. If you just need protection from showers, Portabrace has some rain slickers (custom models for TRV900, PD100 + wide-angle lens, and VX2000 among others). There is another one made by ScubaCam , available in the USA from Band Pro Film/Video which Carrol Lam wrote about. "Ewa camera and camcorder housings are made of double laminated, high frequency welded, UV resistant flexible PVC. Ports feature plano-spherical optical quality glass with o-ring seals. They are available for Auto Focus and Manual Focus 35mm SLR cameras with or without flashes, motordrives and other accessories, as well as several compact 35mm point and shoot models. Practical operating depth with Adventure Series housings is 90', with Master Series glove housings is 60'. Ewa bags are available for many makes and models of camcorders. Ideal for snorkeling and shallow dives, these housings can also be used as rain/foul weather protection. Practical operating depth is 30'." "Please call for help selecting the proper Ewa housing for your camera or camcorder." Many models for various cameras are listed along with the prices which range from $53 to $269. Most of them are $269. The SONY TRV-900 camcorder is not specifically listed and is probably newer than this catalog. Subject: Re: Waterproof housing for TRV900? I just bought one of those "plastic envelopes" made by EWA from B&H photo/video (model VST - $200 - I shopped around and they were the lowest). I was hesitant based on comments such as that just listed. I talked to the salesman at B&H regarding those types of comments. He did not try to sell me his highest price product and his comments appeared legit. He said he has been doing underwater video for 20 years. 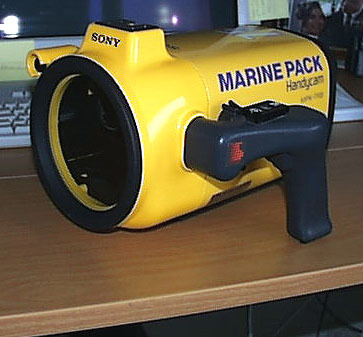 His opinion for somebody like me (the occasional user - snorkeling on vacations or rainy day) was this EWA marine product. I told him about my concerns and he indicated that he has never had a complaint. He said that people who complain are the people who don't take care of the housing unit. If you want to spend more on housing than you did on your camcorder that is easy to do. If you want something reasonable, the EWA housing appears to be the way to go. I received the housing "bag" a few days ago and was surprised at its apparent durability. The plastic is very thick and flexible. I plan on trying it out with a napkin inside. From what I was expecting based on comments from others I'd have to say that I was fairly impressed. Hopefully I'll make that same comment after my vacation. If not, I'll be looking for a new TRV900. By the way, I believe I read it can go 30 feet deep rather than 10 feet. All of the housings that i have seen/found (I never could find the sony sports housing) were always 1200.00 US and up. The ewa-marine is only $199.00 (German made, and now IMO, well done for a baggy). It goes to 33ft, but depending on the amount of air left in the bag, could go deeper. I used the built in trv900 mic..and the rushing currents/bubbles were picked up and sounded great, for my liking. Holding the camera on axis in the rushing currents was a learning experience, but next time, I'll be fine. I hereby report on the Sony Sports Pack SPK-DVF2, which some think does not exist. 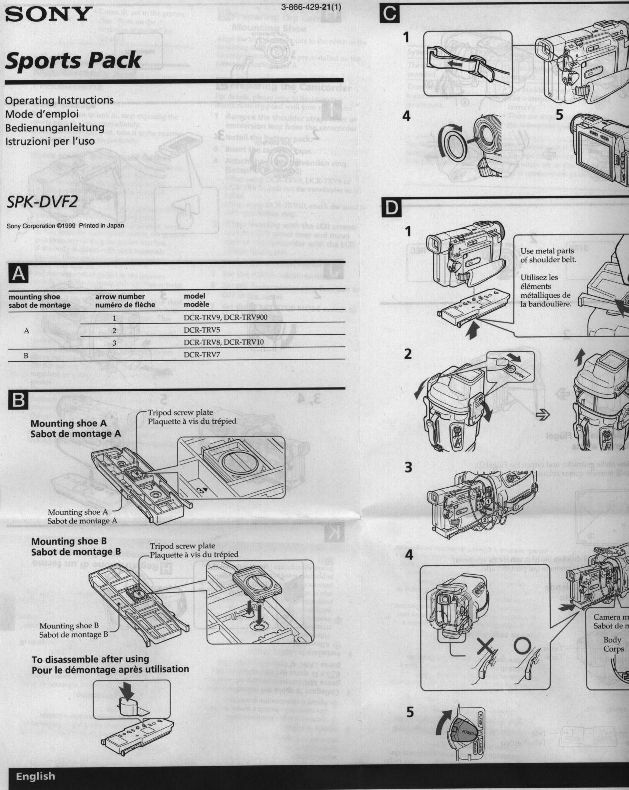 Well it really does exist over here in Holland (and probably the rest of the world except USA - 10 to 1 because of the US liability laws, amazing what companies have to pay to idiots doing idiotic things with certain equipment-) and I have just gotten it from my dealer (for proof: see attachments: picture of box it came in and pictures of "manual"/operating instructions) and specs for little more then $ 250 and checked it out just a while ago. I haven't used it yet, maybe in a couple of days. More photos: buttons, housing with mirror out, component parts. Let me describe the important points/parts/controls. It has an external stereo microphone and one has externally a zoom button (T-W), a mode selector (off/camera/play), a red start rec button and a seperate external photo button. The photo button allows you to write to tape only (you can not select "memory", so no capture to memory card). Only the last is maybe a bit dissappointing, but no more than that. However given the fact that there is an extenal photo button and the camera itself has to be switched to "camera" while installing it in the housing, maybe putting it on "memory" instead, would make it a (progressive scan, I have a Simple 40 mb 5v flash pcmcia card) digital photo camera "only", if one would like. I guess it won't harm to try if one is not interested in "video" during a session with the sportspack. On the left is an extractable externally mounted mirror, which can reflect the LCD screen backwards if the LCD screen is opened flat on the camera with the lcd screen pointing outwards. One can also choose to view from the back of the casing though the viewfinder. In that case the mirror can remain collapsed flat on the side of the waterproof housing. The two connectors inside the housing are for mic and Lanc. The waterproof housing has a wrist and a shoulderstrap, just like with the TRV 900 itself. 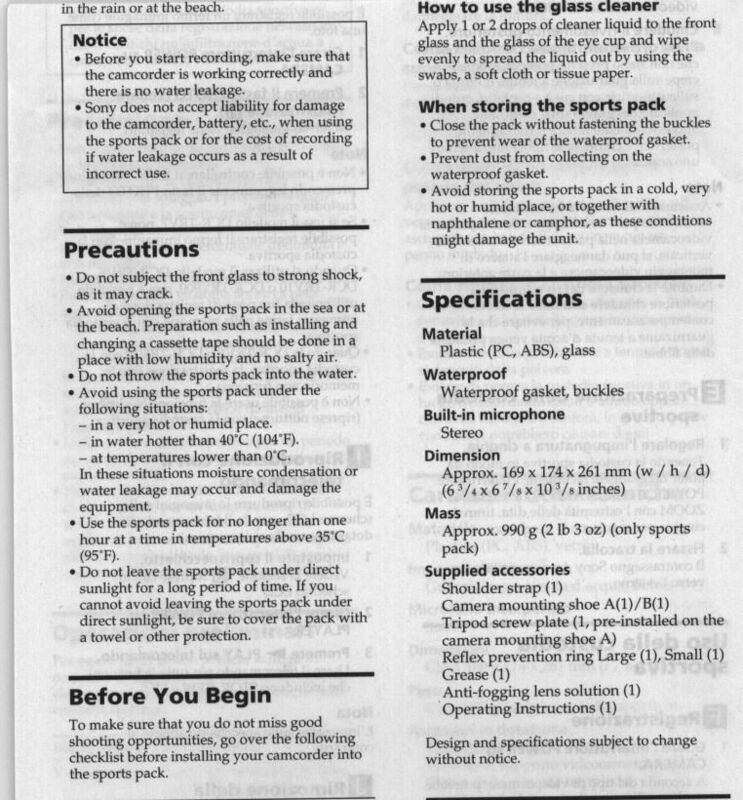 I will use the SPK-DVF2 for filming while (deckmounted) Seakayaking and underwater filming of (kayak) eskimorolls (training/education) in a swimmingpool only, so I do not intend to go "diving". The other uses will be during particularly bad weather in the Scottish mountains (happens more often than one would like) and filming in sandy (beach) conditions. 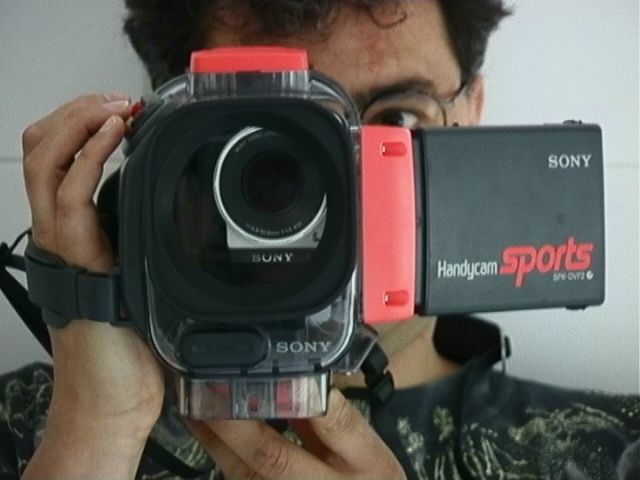 Leonard Fintelman provided me with some great info and pictures on the Sony Sport Pack, not sold in the US. I located a couple of dealers in North America [...] Berger Brothers of New York imports the units in small quantities, and marks them up a whopping 100% above retail, not including shipping and insurance. Several Sony dealers in Canada could get them. Surprisingly, the best price I found was $260 US, from the Sony Store in Halifax, NS. I should also mention that I collected all the info I could on full featured dive housings in the event that the Sport Pack was impossible to get, and although I'm not currently in the market to buy one, a clear winner for the TRV900 pooped out of the crowd of 5 or 6 housing manufacturers. 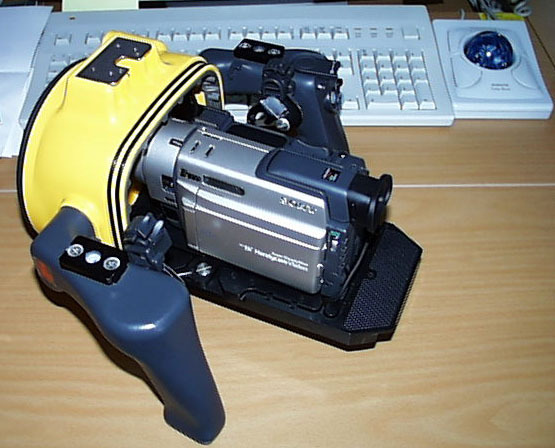 Undersea Video makes a cast polyurethane housing only slightly larger than the camcorder itself (they report a 1/4" hull standoff from the camcorder surface). The housing, called the T-9, has a Control-L (LANC) module epoxy-sealed enabling most of the camera's controls with no thru-hull seals required. Because the case has so little empty space in it, bouancy weights are minimal. The unit comes with external dome port, color filter, and an optional wide angle internal lens to maintain focus throughout the zoom range. Access to the case is via an O-ring sealed Lexan backplate held in place with sping latches. The case, because of the sealed electronics and minimal hull openings can be washed out as a routine maintenance function. I talked briefly with the owner, who admitted to a 7-week backorder and 7-day-a week production. $1089 US. Weight with camera and neutral bouyancy weights, 12lbs. 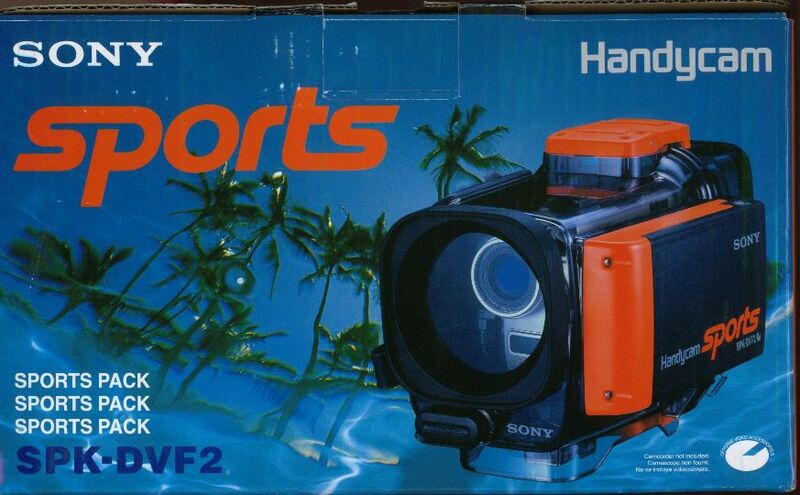 My SPK-DVF2 was shipped from Henry's Of Toronto, a large retailer that advertisies international shipping. Henry's downtown Toronto location has a toll free, 800 461-7960. Their net address is www.henrys.com. My order confirmation originated from address commercial@henrys.com. They take the major credit cards, and ship via UPS or Purolator. They were professional and polite, but didn't invite me to stay with them if I'm ever in Toronto. (sigh) Price quoted was $399CDN + $15 shipping, subject to US Customs duty and Customs brokerage fee. Sport Pack was shipped 6/15 and delivered 6/23, with additional charges of $78.20 US Customs and $34.00 brokerage fee. Total delivered price, $426.20 US. Since no one elected to buy my Sport Pack after family events required that I buy a full-fledged ($!) underwater housing, I took the Pack out for it's first in-the-water trial. Boy, did I learn a lot! The Sport Pack relies on a press fit seal to maintain it's watertight integrity, rather than a brute force o-ring sealing system. The seal kept things dry, at least down to the 3 foot depth I took it. The goal of the day was to film a baby's first openwater swim (float, actually), and get some action shots from a 4-boat expedition up the lake and into the river that feeds the lake as far as a jet cycle could go. Lesson #1 - I tightened the tripod screw that holds the Sport Packs mounting shoe to my TRV900 with my fingers. The shoe and the tiny plastic tab that lets you move the tripod screw to several different positions when setting the Sport Pack up for different models of Sony camcorder is rather fragile looking, and seemed to demand a light touch. Wrong. Although I wrapped the entire Sport Pack in a large towel and secured it inside my Yamaha's waterproof front compartment full of neoprene wetsuits and booties, enough vibration reached the Sport Pack to loosen the tripod screw. The camera, resting on it's side, made contact with the Sport Pack's inner surface at the outer boss around the TRV900 thumbwheel and a tiny area of the LCD screen hinge, scuffing the inner polished surface of the case. Fortunately, the scuffing is cosmetic only, no bigger than a thumbtack, but it taught me lesson #1. Today I'll install those little dime-sized neoprene bumpers that are sold as scratchproof feet for lamps, wherever tha case might make contact. Lesson #2 - It caused no problems, but Sony's warning not to leave the case in the sun for more than 5 minutes should be heeded. I found it advisable to loosen one of the Pack's latches every few minutes to equalize pressure. Obviously this should only be done on dry dry land. A couple of times, the air pressure buildup was enough to cause an audible pop when the latch was released. Lesson #3 - Completely remove the lens cap, to avoid a noise and scratch issue. It gave me no problem, but while crossing some hard wake, I could easily hear the lens cap rattling about. Did the rattling make it to tape? No, but only because of lesson #4. Lesson #4 - Don't become so preoccupied with the hazards facing your TRV900 that you forget to put a fresh tape in your camcorder. With all of the 'new' concerns to consider, I ended up 21 miles from the put-in point with a tape that had only 5 minutes on it. So much for carrying 4 or 5 extra tapes around. Lesson #5 - There is no way I'll hang the TRV900 off the nose of my boat. The rough water and the pace of the group led to some really hard jolts that would easily fracture the tripod mounting boss on the Sport Pack. It's time to find a lipstick cam. By the way, the 5 minutes of video and audio I did get were great. One of my main video hobbies is shooting underwater video when scuba diving, so I've looked into underwater housings quite a bit and tried a few for the TRV900. I thought I'd pass along the info I have in case it would be a helpful addition to future updates of your FAQ. One of the main decisions to make is whether to choose a housing with manual or electronic controls. Opinions and tastes vary widely, but most professional underwater videographers tend to opt for manual controls. The pros of electronic controls are: central location of the controls, usualy on the handgrips, can make them easier to operate, easier to aim; there's not as much to learn, and it's more evident what the controls do; there's no risk of poor alignment making the controls non-functional (i.e., with manual controls if they aren't lined up perfectly, they can fail to push the buttons to activate the control). Amphibico makes a very good electronic housing ($1300 est. street price) called the Dive Buddy. It has very good balance and buoyancy (you want it to be as close to neutrally buoyant underwater as possible), and the controls are easy to use. It doesn't have all the controls needed for underwater shooting, however, most notably white balance mode selection (you have to choose that before putting it in the housing, and not being able to adjust as you go deeper can be an issue). For the price, however, it's the best I believe in the $1000-$1500 range. Amphibico has recently come out with a new housing called the Navigator 900, ($2000) which I have on order but is backordered so I haven't used it yet . It is a manually controlled housing, and sports a wider range of controls, including white balance, full menu wheel control, and manual focus (the Dive Buddy just has access to the autofocus button on the TRV900, the idea being that you leave it in manual then push the auto button when needed, which works pretty well). It also has internal filters (Dive Buddy is external), which is a big benefit since you can not only switch from regular to color corrected shooting (the latter being necessary below about 15-20 feet), but can also switch from regular to macro lens (can't do that with the Dive Buddy). Another intriguing feature is a flip-out LCD viewscreen on the housing itself; all other housings don't let you use the viewscreen or at least not with it flipped out. Many housings have accessory plugin screens you can buy separately, but this is the first I've seen with it incorporated. It looks and seems like a great housing, but if I get it in time for next month's dive trip we'll see. Gates makes a manual housing called the Diego that is also excellent ($1500 for standard port or $1900 including wide angle port). They're a very small company so it can be hard to get a hold of one due to supply/demand issues, but it's worth the effort. It's about as compact as you can get for a housing for the TRV900, great balance/buoyancy, and sufficient controls (including white balance). The controls are simple and easy to use after a few initial dives. It has an easily interchangeable wide angle dome port option (can't change underwater), and has an internal flip filter for the color correction vs. standard filter. Before I heard of the upcoming Navigator 900 this is what I had decided to buy, and if the Navigator isn't as great as it sounds I would be very happy ending up with the Gates housing. Ikelite is the third manufacturer that made the "final cut" in my research (Ikelite, est. price $1100) Unlike the others mentioned, Ikelite housings are made of clear acrylic rather than annodized aluminum. One nice feature about this is that you can see the camera's LCD screen through the housing (not flipped out, but flush with the camera). While this is a nice sounding feature, in application it doesn't add a whole lot, since it isn't easy to use as an aiming device (which is one thing I'm eager to try with the Navigator, since the screen would make it easy to get the camera into small places and not have to guess about where you're aiming). It's manually controlled, includes white balance control, external color filter. Many people have had no problems, but others have reported the housings cracking and becoming discolored/yellowed over time. For someone on a budget, I'd recommend this housing (there are cheaper ones, but not that I'd recommend -- I'd rather do without until I could afford one of the above, rather than save an extra $300-400 and get something not too useable due to very uneven balance and highly positive buoyancy that require additional weighting). I should note that all of these housings have still photo modes which work as well underwater as you found it to work above water. They all also have moisture alarms, which is a must-have for an investment that in some cases costs about as much as the camera. All also have external microphone ports (passing sound through to the camera mic), which captures what sound there is underwater (mostly bubbles, but can also pick up the crunching sound of parrot fish eating coral very nicely, as well as my inadequate attempts at making whale sounds). The housing is good to 75 m depth. LANC connection available in UW house works perfectly with TRV 900. External mic only records in mono - Not a big issue, but would have been cool to record the bubbles in stereo :-] Good enough for background sound + music anyway. There is a video OUT outside the housing, one wonders if the LANC transfer video [no] or from where this connection is supposed to take it's feeded video to a external mounted pressure safe LCD screeen. Other ways around the problems with the small viewfinder? I belive I saw a CASIO small 2.5 " LCD that would actually fit between the camera and housing on the back. But again, how to get the image there? There is a specific [TRV] UW house with a bigger built in LCD in the UW houses viewfinder from SONY however I have as of yet been unable to get any information on availability and pricing. the Sunray Pro HID lighting system. I've made about 35 dives with it so far. bad memories of the ones that got away. Physically the housing, lights, and batteries are big and heavy. with full auto mode or presetting a manual mode before you go in the water. The quality of the images speaks a lot for the 900's auto mode. gear. So do a lot of other folks. was convinced that the TRV900 was the correct digital camcorder for me. ($1,400 with trade in of my old housing). about using the TRV900 in the L&M housing for that section of your site. ears from the whining of the capstan. through the water the colors will appear natural. 20ft away the light path is 30ft! Use the ext. filter. > I have recently bought a trv900 with an Amphibico nav 900 housing. the water the more boyant. Thought you might like to view the still photos I saved from footage I shot with my TRV900 while scuba diving. I housed the camera in a Lights & Motion Stingray II housing. I have their Elite lights (used on the octopus sequence). I used Sony Master DV (DVM60M2) tapes. I shot in normal video mode and then captured the stills I wanted with the floppy disk adapter (superfine image quality) . I wish my housing had the capability of turning progressive scan on and off while in the water. I may upgrade to the LMI Bluefin some day, which does. I ran onto a new rain cover at NAB this year that some of you might find useful. It is made by ScubaCam Ltd in Australia (http://www.reefexplorers.com/) and carried in the USA by Band Pro Film/Video (http://www.bandpro.com/ - 818/841-9655). It costs $105 at Band Pro. Stock #SC/PD100 RN. It is made of translucent vinyl except for a couple of clear vinyl windows for the flip-out viewfinder and the side button panel. It uses both drawstrings and velcro to keep in place along with some access sleeves for camera control. You can use either the internal viewfinder or flip-out screen. I haven't use the "Rainslicker" by Portabrace, but I've seen some reports that it's is somewhat of a nag to install. This cover installs very easily. The front lens "tube" is long enough and large enough to handle my Century 2X tele-extender and/or a lens hood. I had to add a piece of adhesive "female" velcro to it to get closure with no accessory lens or hood on my PD100. There are apparently similar raincovers for the VX1000 and some betacams. I have no association with either company except as a satisfied user. I have the rainslicker. I have used it, but only to test it; in the middle of a downpour, it kept the camera completely dry, while allowing access to almost all controls. It's water-tight and well-designed. It does NOT work very well, however (water on lens), if you have a wide-angle lens attached (particularly one without a lens hood). Is it worth the price? Well, if you're going to be shooting in the rain. However, there is a BIGGER rain hood that some people are buying. That's worth looking at. It solves the wide angle lens issue, for one. I doubt the 900 rainslicker would work with the BeachTek XLR adaptor. The 900 rainslicker fits very tightly, particularly on the bottom. FWIW, I have THREE Portabrace products now (in addition to the rainslicker, the 900 bag, and the hip pack for camcorders). I think they are EXCELLENT products. Cannot recommend them highly enough. VERY well-designed. Many "hidden" design features (subtle ones) you may not notice in the store, but after you've purchased one and used it a while, you'll start to be amazed by how well these products are designed. I recently bought a TRV900 after reading your site, primarily for underwater use. The housings seemed too expensive, and I bought a used Light & Motion Seahawk TR housing with Lights for $650 U.S. This housing was made for the Hi-8 models, but I found, with a few well placed drill holes, it can easily be converted for the TRV900, saving significant dough for those diving trips! The front panel with the lens (bottom left corner) is attached to the housing by two bolts on a flange that is external and does not interfere with the seal at all. All you have to do is unscrew the bolts, cut the microphone wire (and rewire it later), rotate the faceplate until the lens is in the top center, and drill new holes in the flange (very carefully!). Once replaced, the camera has to be raised up a little bit to see through the lens with no obstructions, and the really close zooms won't focus properly (although I think that may be fixable), but other than that it works very well. All the controllers work except for white balance, which supposedly isn't controllable through LANC on a TRV900 and focus, but again, I think that may be fixable. I haven't actually used the camera in the housing yet, taking the empty housing for a few test dives to make sure I made no stupid errors, but - so far - everything seems great - all for $650 (with lights) and a couple hours of modifications. Just an update on the modified SeaHawk housing I've been using with my TRV900. Everything is working well and I haven't had any leaks yet (knock on wood), despite probably 10 or 15 dives with the maximum depth I've taken it to around 230 feet. The halogen lights don't work too well at that depth, but the housing has been stellar. The only problem is the microphone cuts out after 190 feet for some reason. I've since realized that you don't need to cut the microphone cable, just unscrew the electronic control board and pull out the mic wire. Then you can rotate the faceplate, drill the new holes, and presto. One caution, the switches on the side of the housing use magnets, so the control board needs to be put back in the exact same place. It's not too difficult with some trial and error. Have fun, and if anyone wants some pics or advice, feel free to email me at (aldengreenhouse at hotmail com). We (www.scret.org) use the TRV900 exclusively for underwater video - but we were presented with a unique problem - all of the housing on the market fail between 200-250 feet of depth, and we have some wrecks down to 350. Halcyon Manufacturing makes a housing that goes much deeper, and might be of interest to your web visitors: www.halcyon.net/lights/vidhouse.shtml. It's a very simple design that is rugged and can take any depth you might ever go on scuba. 1. You cannot see the manual controls as they interact with the camera, except for the power switch. As long as you set the focus on manual and don't' inadvertently turn it back to auto (which would be much more unlikely if you could see the control interface through a view window and, if it did occur or if you had forgotten, could be undone) that's not so bad. 2. 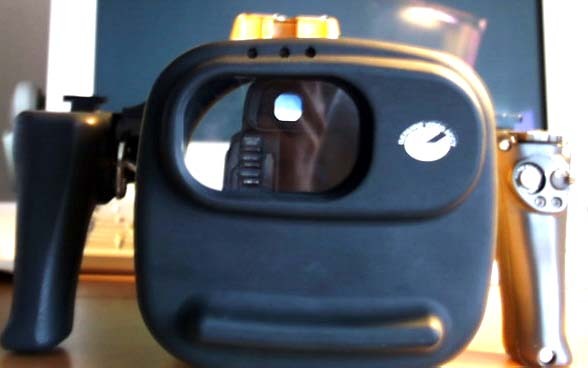 With the Catalina housing, you can't use the still feature of the camera. there's no control for it. From your site I can tell that this won't be a problem with the Gates housing for the trv900. Otherwise I've been pretty happy with the Gates housing, which I purchased from camera tech.